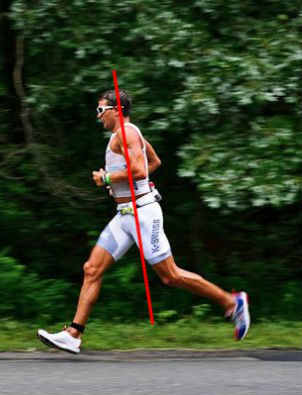 The “heel-striking” running gait doesn’t observe the requirements of the human body’s mechanical paradigm. Those who say that the midfoot strike is the “ideal” running stride often conclude that midfoot striking is “better” for a variety of reasons. One of those reasons is that, allegedly, the midfoot strike is more “natural” than the rearfoot-strike (also known as the heel-strike). It’s a bad idea to call the midfoot strike more “natural”—aside from the fact that the allegation is wrong: humans use a variety of different footstrikes for a variety of different activities. Rearfoot striking ahead of the center of gravity is the default walking strike. Rearfoot striking is also used to abruptly halt forwards momentum, and sometimes, to turn by using the heel bone as a pivot. Conversely humans use a very anterior (forefoot) strike during the acceleration phase of sprinting. In short, the problem with this “natural” argument is that human feet strike the ground all over the foot map. So stop calling it natural. Which is why I prefer to adopt a more technical term: paradigmatic function. This term means that a certain function X is more in line with a particular structure, or a particular configuration of a structure. For example, variable-geometry aircraft—those which have the ability to “sweep” the wings back from an extended position to create a triangular shape (such as the F-14 Tomcat)—use the swept-back configuration for combat and supersonic flight, while they use the extended (regular) position for takeoff and landing. For the F-14 Tomcat, the paradigmatic function of the extended configuration is takeoff and landing, whereas the paradigmatic function of the swept-back configuration is combat and supersonic flight. Although it is no doubt possible for the F-14 to land with the wings swept back and enter combat with the wings extended, there are two things to consider: (1) each configuration works better for each activity, meaning that (2) each configuration “solves” a different problem: the swept-back configuration allows for greater maneuverability and speed, while the extended configuration allows for greater stability and reduced speed during landing. Central to systems thinking is the idea that every system (or configuration of a system) is built to solve a particular problem. For example, a system with a branching structure, like a tree, a lung, or a network of roads, solves the problem of getting the maximum amount of energy or nutrients to and from various places with the least amount of effort. The shapes of systems always correspond to the most parsimonious way to solve a particular problem. In a very real way, you can think of all systems—and each individual configuration of those systems—as solving a problem that is specific to each system or configuration. The very same goes for walking and running, the two important gaits—the two functional configurations—of the human body. In terms of the stresses absorbed by the body, the most important difference between walking and running is that in running, there is a flight phase, while in walking, there isn’t. This means that one of the things that the body needs to do while running is absorb the shock of landing, while in walking, this particular need is largely absent. This theory is largely borne out by looking at the muscles used during walking: the largest muscles in the body—the gluteus maximus, the psoas major, and the hamstrings—are largely inactive. Because of this, the knees remain locked during the walking gait. This means that by walking, the body “solves” the problem of preserving energy while remaining in motion; that’s what the walking configuration is for. Because a necessary component of running gait is the absorption of shock, the landing portion of the running stride should incorporate a shock-absorbing motion. So, in order to figure out what kind of motion comprises the landing portion of the running stride, let’s review what a “purely” shock absorbing motion looks like: landing from a jump. When we land from a jump, our hip and leg mechanism works largely like a shock-absorber: we land on our midfoot or our forefoot, and all the joints of the lower extremity go from a lot of extension to a lot of flexion in less then a second, meaning that the hip, knee, and ankle all flex together. 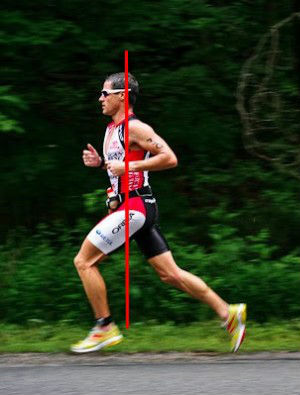 (This is known as triple flexion). This means that the paradigmatic function that the body uses to absorb shock is triple flexion. Similarly, in order to jump again, the body extends the hip, the knee, and the ankle simultaneously (which is known as triple extension). In order to create triple flexion and triple extension, the body must recruit the largest muscles of the body, including the hamstrings, gluteus maximus, psoas major, and quadriceps. In other words, the triple flexion/extension configuration solves a very different problem than the one solved by walking: it allows the body to safely absorb the energy of impact, while powerfully exerting force against the ground. Because running necessarily has a shock-absorption component and a takeoff component (because of flight time), it stands to reason that, during running, triple flexion and triple extension should form an integral component of the contact and pushoff phases (respectively). This is where it gets problematic. The typical heel-strike (overstriding with initial rearfoot contact) plays out very differently from triple flexion: as the foot strikes the ground, the knee is mostly locked but the leg is stretched out in front and the foot is raised. The hip is in flexion, the knee in extension, and the ankle in flexion. This means that the shock absorption capabilities of the leg are reduced—and because the leg flexes less, it has a lower capacity for pushoff. (The lower achilles tendon loading of heel striking as compared to forefoot striking may attest to this). I’ll leave the issue of heel-striking under the center of gravity for another post. For a taste of why it might be problematic, try jumping up and down in the same spot while landing on your heels. It’s extremely difficult. In contrast, the midfoot/forefoot strike is a great example of the triple flexion/triple extension principle at work: When you land on your midfoot, your leg compresses like an accordion: the ankle, knee, and hip create a zig-zag shape, which straightens as you push off. Midfoot striking adheres strongly to the musculoskeletal configuration used for shock absorption/propulsion movements. In my opinion, the best way to know if you “are” a heel-striker in some essential sort of way is to jump up and down, and to see if it is easier for you to absorb shock by landing on your heels than by landing on your midfoot or forefoot. (Unlikely). If that isn’t the case, and yet you heel-strike while running, it might be time to look at muscular imbalances and power leaks, particularly in regards to muscular interactions at the hip area (illiopsoas, lower back extensors, gluteus maximus, quadriceps, and hamstring). And then, embark on the long road of responsibly changing your gait. Previous PostA question of systemic resilience: is it more “efficient” to run shod than barefoot?Next PostOn the importance of the Internal Obliques.